You can reset all the menu and customized settings as the factory defaults. 3. 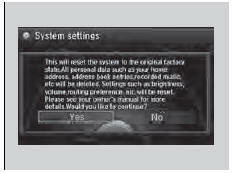 Rotate to select Factory Data Reset, then press . 4. Rotate to select Yes, then press . 5. Rotate to select Yes, then press again to reset the settings. • Other display and each item settings.